Brain in a jar is the perfect soap gift for any zombie fan! The Washing Dead features a brain dead black brain, Zombie Brain features a zombie snack green brain, Brain in a Jar features a healthy speciman pink brain, and Brain Wash features a gray matter gray brain. Great as a Christmas stocking stuffer, holiday soap gift, Secret Santa gift, or gift for teacher! 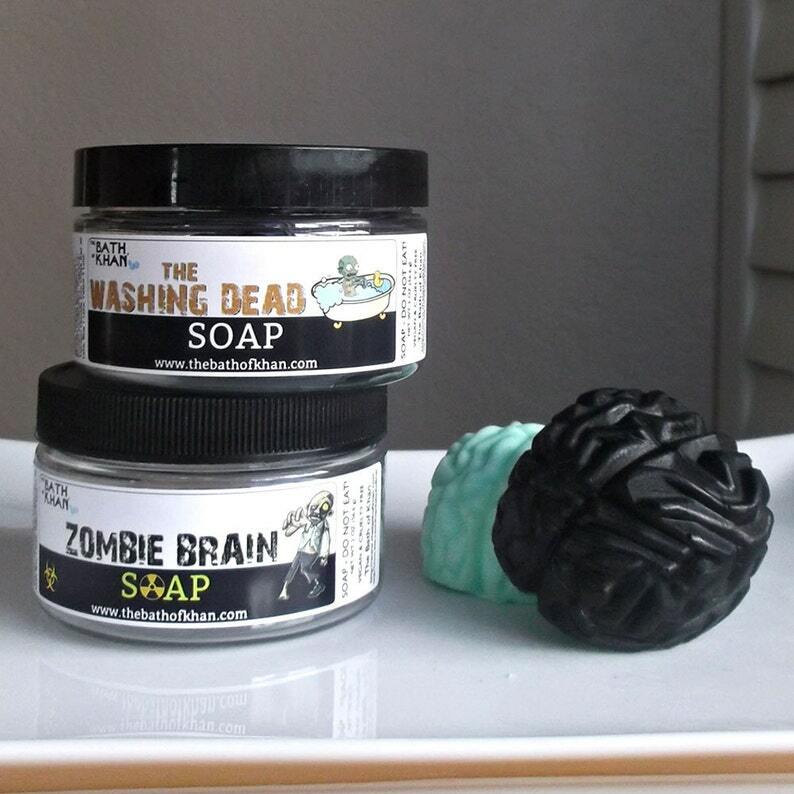 Brain soap also makes a perfect zombie party favor or a dead party favor. 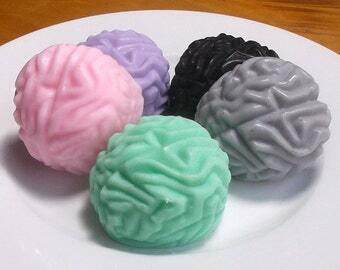 Brain soap is unique, will add to your decor, and is sure to be a hit at your party. Choose from 4 different styles; Brain in a Jar, Brain Wash, Zombie Brain, and The Washing Dead. Brain in a Jar features a healthy specimen pink brain scented in cotton candy. Brain Wash features a gray matter gray brain scented in fruit smoothie. Zombie Brain features a zombie snack green brain scented in birthday cake. The Washing Dead features a brain dead black brain scented in bubblegum. Brain soap is fastened to the bottom of jar with clear soap and is easily removed. 1 pc. Brain in a Jar. Ingredients: Glycerin (kosher, of vegetable origin), Coconut Oil, Palm Oil, Safflower Oil, Purified Water, Sodium Hydroxide (saponifying agent), Sorbitol (moisturizer), Sorbitan oleate (emulsifier), Soy bean protein (conditioner), Fragrance, Titanium Dioxide, Iron Oxide, Red 40 Lake, Yellow 5 Lake, Blue 1 Lake. Pink brain also contains: Bis(Glycidoxyphenyl)propane / Bisaminomethylnorbornane copolymer, Aluminum Hydroxide, Red 28, Red 22. Love my items! I received them before than expected and it was in perfect condition! Fun soap! Can't wait to give as Christmas gifts!